Folie is a delightful old-fashioned term, which doesn't mean madness as you might think, but leafy area. By extrapolation Folies was the name given to the elegant, and often extravagant country houses the wealthy Parisians built around Paris during the 18th century. Sadly, most have today disappeared. 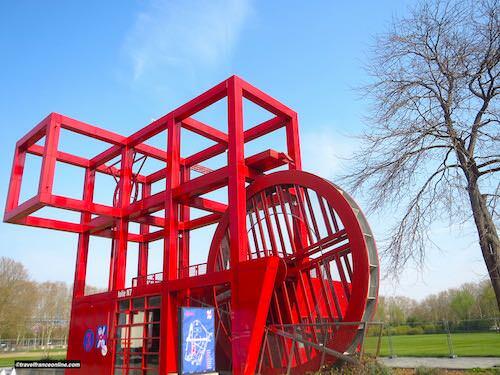 However, you might have heard of the Folies the architect Bernard Tschumi designed for the Parc de la Villette. 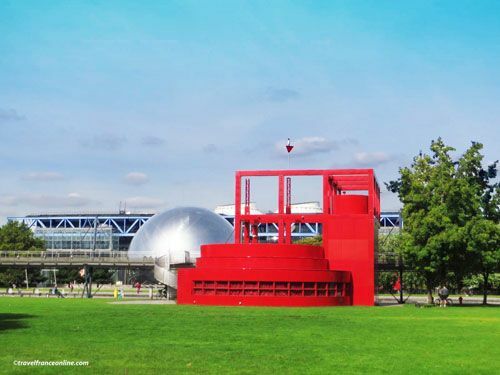 These 26 Folies, which are scattered throughout the park, are bright red metal structures that beautifully stand out against the green lawns. Their square bases are identical in size (10,80m aside), however, their shapes vary according to their use. Antenne Secours (N7) is located on the east side of the Grande Halle. Eclat de Folie (L1) houses the visitors reception point at the northern entrance of the park by the Metro station Corentin Cariou. 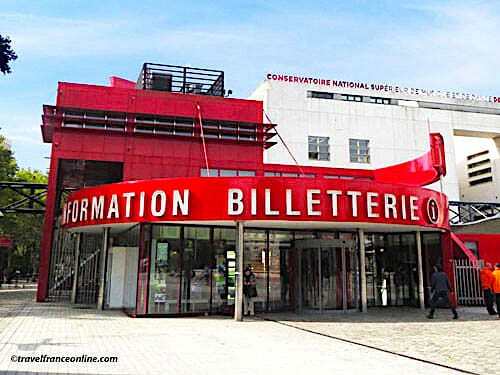 Folie Information-Billetterie (L9) is the ticket office and information centre. 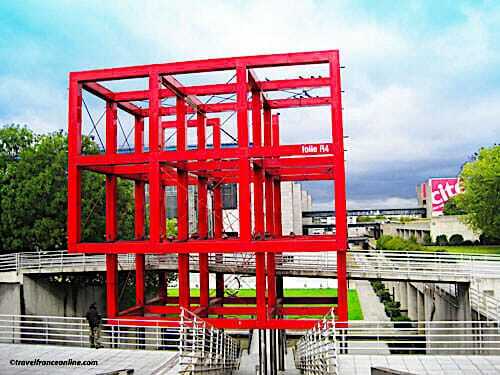 It is located at the other entrance of the park, along the Avenue Jean-Jaurès and Metro Porte de Pantin. Folie Philharmonie 2 (N9) serves as the entrance to the Philharmonie de Paris, opposite the Information-Billeterie. Folie Argonaute (P4) accesses the decommissioned submarine Argonaute located in front of the Sciences and Industry Museum. Folie Ateliers Villette (L7) is on the east side of the Grande Halle. It houses as series of cultural and thematic workshops. Folie Ateliers Villette (P5) is complementary to the previous one. It is located by the Canal de l'Ourcq. 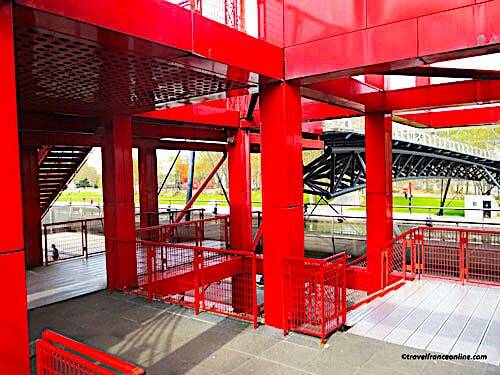 Folie Belvédère (P6) is located next to the Buried Bicycle and consists of a ramp and spiral staircase. Folie Billetterie du Zénith (R6) serves as entrance to the concert hall. 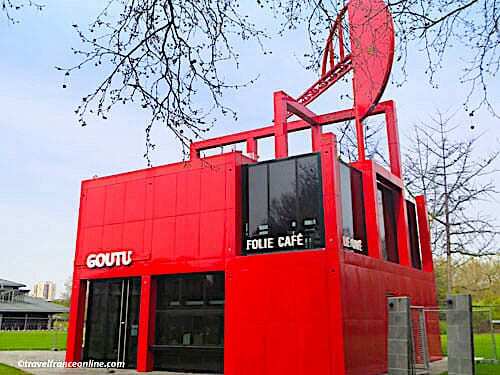 Folie Café Goûtu (P7) is by the Zenith, on a vast lawn hosting the Open Air Cinema every summer. It houses a terraced cafe serving fast food. Folie du Canal (N5) houses a physiotherapy training centre. Folie Echangeur (R5) is connected to a footbridge spanning the Canal de l'Ourcq. Folie de l'Ecluse (L3) is located by a lock (écluse). It links to the footbridge spanning the Canal Saint-Denis. Folie Escalier (R4) is located right next to the equestrian center and the Geode. 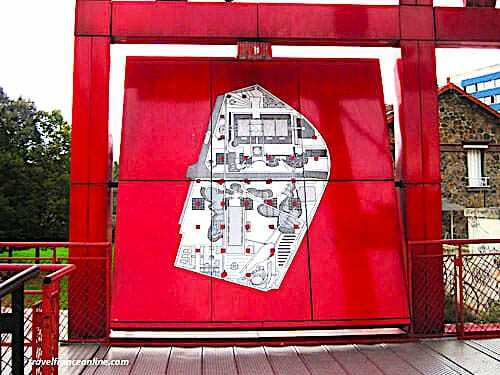 Folie Horloge (N1) is located near the WIP Villette. It showcases the face of the monumental clock installed at the entrance of slaughterhouses in 1877. Folie Janvier (N8) is located behind the Pavillon Janvier. This elegant neo-classical building used to accommodate the mail and police offices. Folie Kiosque à Musique (L4) is located opposite the Sciences Museum. It is a venue for outdoor concerts during summer. Folie L2 - houses the restaurant A la Folie Paris. It is located near the Science Museum and by the WIP Villette. Folie Médiation (N6) hosts a series of workshops dedicated to cultural mediation. Folie Musique (P8) faces the Philharmonie de Paris by the south entrance. La Folie Observatoire (N4) faces the Geode and the Sciences Museum and offers the best views of the park. La Folie Rond-Point des Canaux (J5) is located at the junction of the Canal Saint-Denis and Canal de l'Ourcq. Folie Théâtre (L8) serves as entrance to the Théâtre Paris-Villette. The theater was moved to this building, the former Halle aux Cuirs (Leather market), in 1986. La Folie des Vents and Dunes (L6) houses a secure recreational space dedicated to young children (0 to 2 years) and older (up to 13 years). 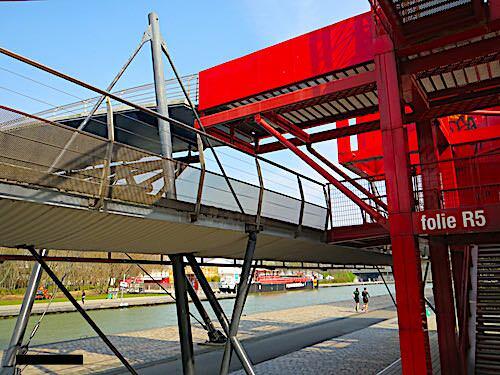 Folie des Visites (L5) is located at the junction of the Galerie de la Villette and the Ourcq. 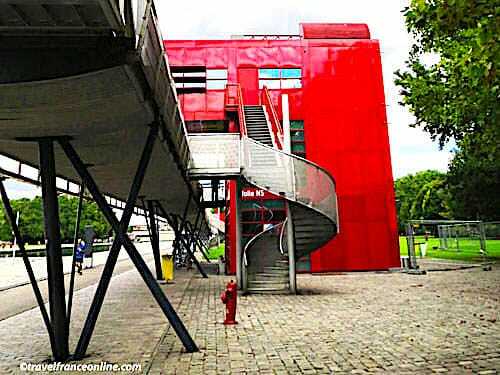 It is houses the Ateliers Villette workshops for children and a restaurant. La Folie Trabendo (R7) hosts a concert hall with a capacity of 700 seats.